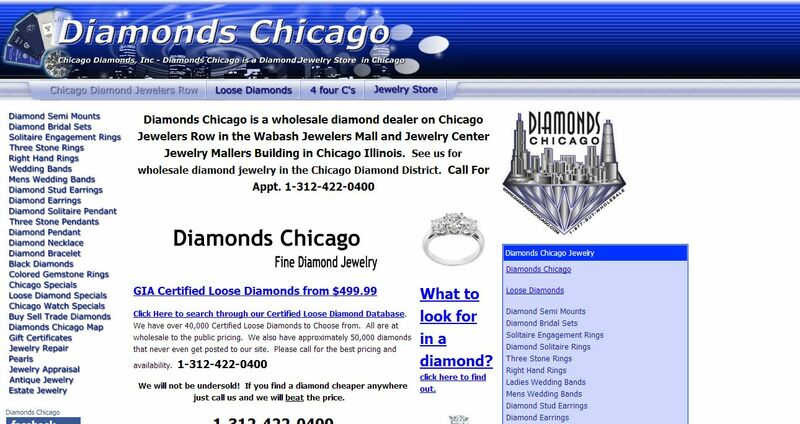 Diamonds Chicago address, phone, website, hours of operation, and more. Diamonds Chicago Is a Wholesale Diamond Importer and Diamond Jewelry Manufacturer and Dealer to the Trade. Diamonds Chicago is Dedicated to providing High quality Diamond Jewelry at Extremely competitive prices. Diamonds Chicago Has a large customer base Including Independent Jewelers and Jewelry stores to Big Mall and Chain Stores. We also sell Loose Diamonds to a number of other Diamond Wholesalers and Dealers. Diamonds Chicago is a full service Diamond and Diamond Jewelry Distributor With all Shapes and Sizes of Loose Diamonds in every Cut, Color, Clarity and Carat weight. Diamonds Chicago is a very aggressive company that is growing every day. Our customer base Grows on a daily basis due to our aggressive Pricing. We take the time to sit down and talk with our customers to find out exactly what diamonds will suit Their particular needs.